Scranton’s own Tigers Jaw celebrates the 10th Anniversary of it’s self-titled album with a homecoming gig in Scranton. Ritz Theater in downtown Scranton- 222 Wyoming Ave.
All previously purchased tickets are good for the new location. No need to do anything. 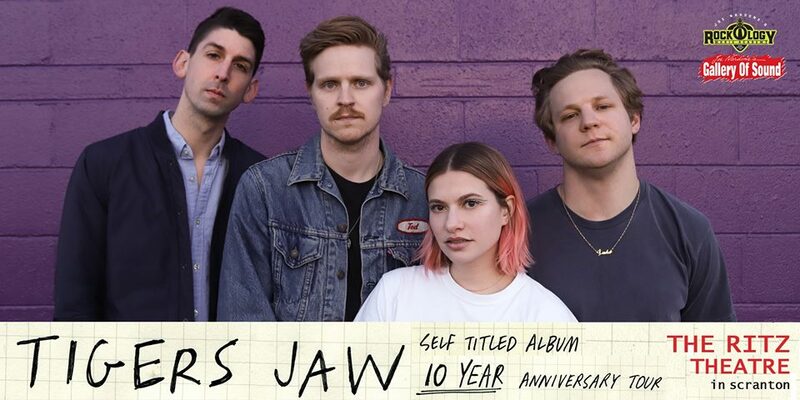 From Tigers Jaw: “Ten short years ago, we released our self-titled album. Recorded on nights and weekends at JL Studios in Wyoming PA during our high school years, it was our first time setting foot in a studio. The raw energy and youthful intuition (or lack thereof!) of those songs are the monument of a really special and formative time for us. There were no rules, no preconceived notions of how anything should sound, nothing more complicated than some friends making music together because it was fun.Lucky for us, it’s still fun, and fulfilling, and amazing that we get to travel and make music. After all these years, these songs still resonate strongly with us and with so many others, so we have decided to honor it with an anniversary tour.